When sixteen-year-old Sydney discovers she is pregnant, she tells only her best friend and hopes in vain that she’ll miscarry. Her divorced parents, unaware of her pregnancy and fed up with her reckless behavior, send Sydney on a wilderness canoeing tour in Canada in the hopes to straighten her out. As the days pass and Sydney’s pregnancy progresses, she thinks back on her choices and is forced to come to a decision about her future. This introspective novel explores Sydney’s life and her relationships, with her parents, her best friend, her romantic encounters, and her own demons. Gramont focuses on Sydney’s slow personal growth, and the unexplainable yet magnetic dynamics between her protagonist and the supporting characters. It’s in Sydney’s interactions and unexpected strong connections to the most unlikely people in her group that force her to own up to her mistakes and take responsibility for her actions. 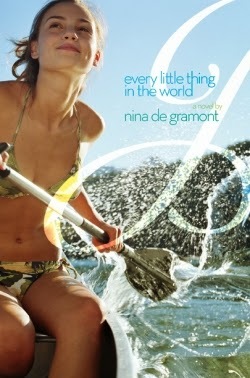 Every Little Thing in the World is a novel about possibilities, connections, and the power of redemption. Cover Comments: I like the bright colors of this cover, and the look on the girl's face--full of bliss. The water looks really cool, and makes this cover look really active. Glad you liked it!! :) I want to read this one but I haven't been able to buy it yet, :P keep putting it off.